We had our first kale harvest this week! The Siberian kale, planted in one of our raised beds, has been an impressive crop to date, growing vigorously all fall and providing us with 5 lbs for our dinner-tables this evening. We are also harvesting flats of microgreens and pea shoots. Microgreens have made a splash in the markets over the past few years with their nutrient-dense nature, quick harvest times and relative ease of growth. We are growing radish, mustard, kale, and peas and will be harvesting flats ever 2-3 days through the fall and again in spring. More info on micro-greens can be found here, and if you are interested in trying to grow some indoors this winter, check out this how-to from Organic Gardening magazine. In other news, we’re battling loopers and other caterpillars as well as a small number of aphids in the raised beds; hopefully, the next cold snap will drop their numbers and give the Lacinato kale a chance to grow. In the meantime, baby lettuces, beets, and radishes should be greeting us in the next week, while the turnips, collards, and Broccoli Raab are all healthy and happy. Below is a recipe from epicurious for bean and kale soup which is a regular hit here on the island. It’s an excellent way to use kale quickly during times of heavy harvest. Interestingly, kale can also be frozen for months, making it an ideal crop for areas with little or no winter growing season. Great summer, looking forward to fall! It was quite the summer here in the Little St. Simons Island organic garden! We had an exceptionally wet season this year. For example, in just a three-week period, we had three storms with a total of 11 inches rainfall between them, and this pattern seemed to hold true for much of the summer. As you can imagine, this is both a blessing and a curse and we’ve been busy just keeping up with the growth of both friend and foe. Thankfully, those long summer days provide plenty of time to get the work done and stay just ahead of the curve. As our first tomatoes ripened, the crows got the first taste, but we were able to add garden fresh tomatoes to our dinner salads. Until a few weeks ago, we were still hip-deep (literally) in flowers as well; it’s been a zoo of zinnias, celosia, and dhalia, all vying for a spot in one of our lodge-side flower arrangements. We also saw success with Burgundy Okra, Malaysian Dark Red Eggplant, and a variety of peppers and basil. Speaking of which, we’ve had incredible fortune with a variety of basil known as “Mammoth”- fast growing and hearty, with a taste like Sweet basil and large, wavy leaves. The fall season has been great to us so far as well, with the comfortable drop in temperature being just the first of our blessings. We have healthy beds of autumn and winter greens started and, so far, they’re doing fantastically. Siberian Kale, in particular, has proven to be a hardy and fast-growing choice that is currently paired with “Misato Rose” radishes in one of our raised beds. This week should see the planting out of the rest of our first round of greens, including Georgia Collards, Broccoli Raab, turnips and spinach. As for harvest, we are in full swing with loads of Meyer Lemons and Satsuma tangerines already showing good color. Finally, we got the opportunity to finish a year-long experiment in controlling our nematode population through cover cropping. We planted two beds in sweet potatoes, with one bed having been cover-cropped in rye which, in turn, had been plowed in before the planting. That bed produced 40 lbs of delicious potatoes while the other bed, our control, produced only 10 pounds! We will be employing this method on beds from here out and hope to continue to see improvements. Other improvements we are excited to see include an expanded and extended blackberry trellis to double current size for our four new berry canes, and a more permanent structure for the 3-bin composting systems. Next time you are on the island, we invite you to the garden to have a look (smell and taste, too) at the progress! Our gardens provide such a wonderful opportunity to witness close up the transformation all of life undergoes with the changing of the seasons. From the new plant life sprouting up as the soils warm, to the insect world expanding rapidly before our eyes and new polinators and benificials arriving to do their part of gardencaretaking, to the sweet cries of the eastern blue birds nesting in the garden bird box. Here at LSSI our garden tenders are preparing for change this spring as well. Amy, our gardener since 2009, will be handing off her trowel soon and focusing her energies in the pursuit of tending young minds and planting seeds of possibilty as a teacher. With deep gratitude Amy has put together a short history in pictures of the gardens evolution. It has been a wonderful adventure indeed! LSSI Garden History on Vimeo. Luckily another local gardener joined our team at LSSI recently, Aaron Bell of Jekyll Island, GA.
Aaron will take over the garden tending and enhance our “seed to table” program by spliting his time between the growing the garden and assisting the Chefs in the kitchen. Watch for Aarons passion and creativity to bloom in the Little St. Simons Island garden and dining room!! Just when we need that extra boost of Vitamin C the winter’s harvest of citrus ripens providing us with a wide array of both sweet and tart citrus for eating, juicing, and preservation. Citrus was first introduced into the continental U.S. by early Spanish explorers at St. Augustine, FL in 1565. Here on Little St. Simons Island we are enjoying the first significant harvest from our citrus grove planted 2 years ago (trees are now 3-5 years) in the USDA Organic Garden. Citrus is grown by “grafting” (joining) a favored selected variety to the rootstock of a citrus known for it’s hardiness and adaptability. For our region Trifoliate Orange (Poncirus Trifoliata) is the rootstock to ask for at the nursery. The first few years of a newly planted citrus need frost protection. If a tree freezes below the graft it will grow back as the (usually inedible) rootstock. At LSSI we have planted some of the most cold tolerant varieties that are common favorites for the home garden as well. For a sweet peeling fruit we have grapefruit, oranges and tangerines. The Satsuma Tangerine (mandarin) is one of the best for our region with it’s easy to peel skin and sweet fruit. It is also know to be very prolific. A favorite variety is Owari. Tart citrus are great for marmalade, jellies, and sorbets and are a great substitute for limes and lemons in the kitchen. Calamondine (above) is hardy into the low 20’s and Kumquats can handle temperatures as low as 15 degrees. A kumquat with more sweetness is the Meiwa. Chef Paula reminds us to always use/eat the peel of these thin skinned fruits since it’s in the peel where the sweetness is stored. Fresh limes are a lovely addition to the home garden but that typically been known for cold sensitivity. A new lime-kumquat hybrid is showing great promise for our region and is next on the planting list for LSSI. Chef Paula has been getting very creative with the citrus harvest this year. Try this incredible citrus marmalade over some olive oil cake for your next special gathering. In a large, non reactive pot, bring oranges, sugar, and lemon juice to a boil. Let it cook for about 10 minutes to give the peels time to soften. After they have softened a bit add the pectin packet and let the mixture cook for another 10 minutes, stirring frequently. When the marmalade coats the back of the stirring spoon smoothly, it’s done. If you want to can your marmalade, pour it into hot, sterilized jars. Wipe rims of the jars off with the edge of a dish towel dipped in boiling water. Apply new lids and screw on bands (you can always reuse canning jars and and the screw on bands, but you never want to reuse the lids). Lower the filled jars into a hot water bath and process for 10 minutes. Soon after you remove them from the water bath, the jars should let you know that they’ve sealed by letting out a pinging noise. If you miss the signal tap on the top of the jar, if the lid gives at all, the jar did not seal. Best to stash those in the fridge and enjoy now. Preheat oven to 350 degrees. Lightly oil an 8 inch diameter cake pan then coat with cornmeal and remove excess cornmeal. Whisk the flour, baking powder, and salt in a medium bowl to blend. Using an electric mixer, beat the sugar, eggs, and zests in a large bowl until pale and fluffy. Beat in the milk. Gradually beat in the oil. Add the flour mixture and stir just until blended. Stir in the almonds. Transfer the batter to the prepared pan. Place cake pan on the baking sheet to collect any possible spills. Bake until a tester inserted into the center of the cake comes out with moist crumbs attached, about 35 minutes. Transfer to a rack and cool for 15 minutes. Remove cake and place on a serving platter, top side up. Dust with powdered sugar. With winters arrival, gardeners and farmers everywhere are taking advantage of this quiet time of the year to retreat inside for the life long learning, reflection, and inspiration that comes with the humbling efforts of putting seed to soil. The gift of darkness brings with it time to sink deep into gardening books and resources, time to lavish in the beauty and potential with the arrival of 2013 seed catalogs, and much needed opportunities to gather the community together for learning and celebration at one of the many farming and gardening conferences happening around the county this winter. This blog entry comes with an invitation to it’s readers to write in and share sources of knowledge and inspiration you are growing with to be added to the resource pages of this blog. The Seed Underground; A growing Revolution to Save Food by the inspirational writer and local farmer Janisse Ray. A Georgia Food Forest by Permiculturist Cynthia Dill. An incredible perennial crops and permiculture gardening guide for Southeast GA, and beyond. Teaming with Microbes By Jeff Lowenfels and Wayne Lewis. The Organic Gardener’s Guide to the Soil Food Web. An excellent resource for understanding that delicate system of life beneath our feet on which all life stands. The Soul of the Soil by Grace Gershuny and Joe Smillie. A soil building guide for master gardeners and farmers. Citrus Fruit for Southern and Coastal Georgia. A UGA publication. Winter and early spring are a great time to get new citrus trees planted for years and years of Vitamin C! North Carolina State University, Department of Bio & Ag Engineering, Annual Vermiculture Conference. For all the Wormers out there sitting at the edge of their seats like I am for more knowledge on the Vermicomposting this is one to watch for next fall! I was thrilled for the opportunity to attend the Nov. 2012 conference in Chapel Hill, NC with all the leading industry professionals, university researchers, and vermicomposters from around the world. Professor Sherman’s website is a great resource to explore for vermicomposting technology. “A garden is a grand teacher. It teaches patience and careful watchfulness; it teaches industry and thrift; above all it teaches entire trust.” Gertrude Jekyll. Considering the Extreme challenges we have with the Plant Parasitic Root Knot Nematodes we are thrilled to report great success with our first planting of the RKN resistant varieties of Certified Organic Bell Peppers: Carolina Wonder and Charleston Belle. The first of organic seed with RKN resistance to be released comes from the company Southern Exposure Seed Exchange. Check out SESE for an abundance of great information on heritage seeds and diverse crop varieties for southern gardens. Their catalog alone is a masterpiece and will no doubt have you dreaming of your grandmother’s garden. Another sweet pepper we loved this year is the Sweet Marconi. An Italian Heirloom with tapered fruit that is known to grow up to 10 inches long. This is a tall, very prolific plant that is great for containers or raised beds. Chef Paula has been making a lot of great chow-chow this summer with the LSSI garden peppers. Chop Peppers and Onions in food processor or run through a grinder. Put vinegar, sugar, and salt into an 8 quart or larger pot; heat to boiling and stir in peppers and onion. When mixture boils, reduce heat and simmer (stirring often) for 30 minutes. Pour mix into hot sterile jars. Fix with hot sterile lids and tighten rings. Makes 5-8 pints. into a much needed organic fertilizer for the garden. These Red Wigglers prefer temperatures in the 70’s and 80’s. As a sign of cooler days ahead, we are beginning to see the presence of the band seen on the worm above. It’s called the clitellum and it is the indication that the worm has reached reproductive age . The hatchlings will in turn become reproductive themselves in 60 to 90 days. These vermicomposting worms “process” food scraps into fertilizer in about 2 months time. That’s about 200 pounds of castings, every 2 months, from each of the wooden bins pictured below! And what that means for us is whole lot of worm castings for our organic garden!! These worm castings —known as BLACK GOLD by farmers and gardeners— provide plant nutrients, micro nutrients, and growth compounds for healthy plant development and inoculate the soil with beneficial bacteria and fungi. Increasing microbial activity in the soil benefits the garden by increasing organic matter, preserving soil moisture, and storing nutrient in the soil. This improves the plant’s resistance to disease and pests as well. We use our vermicompost castings in the garden in several ways; added directly into the garden beds, in our seedling trays for plant propagation, by making “compost tea”. Small quatities of castings are of exponential value when made into a liquid fertilizer and used as a foliar spray or soil drench. This 1 lb. bag will affectively cover 1 acre of garden, yard, or farm. Vermicomposting on LSSI has made growing an organic vegetable garden at the beach possible. Think what it could do elsewhere! Vermicomposting is a simple composting method appropriate and useful for urban dwellers, farmers, schools and other institutions alike looking for a sustainable resource management tool. For more information on Vermicomposting refer to the book “Worms Eat My Garbage” by Mary Appelhof and come visit the USDA Certified Organic Garden on Little St. Simons Island. This unusual fruit has found a place in the Organic Garden on Little St. Simons Island. 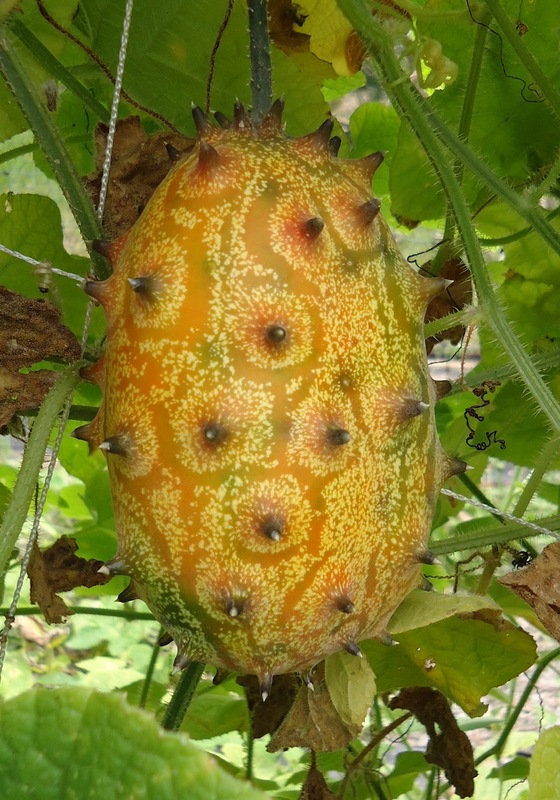 Cucumis Metuliferus, a member of the cucurbitaceae family, known as African Horned Melon, Jelly Melon, Blowfish Fruit, or Kiwano, is native to Southern and Central Africa. Having a cucumber flavor with hints of melon, lime, and banana it has proven to be a late summer harvest perfect for sorbet. The fruit is considered a good source of protein and Vitamins C, A, Iron, and Potassium. Plus it can withstand the monstrous squash bugs in the garden right now–check out those spines! These prolific vines provide fruit here from July until the first frost –perhaps December. Our Chefs will soon begin to harvest the fruit of the prickly pear cactus, growing wild on Little St. Simons Island, to combine with the Kiwano Sorbet. Served in its frozen spiky shell it makes for an intriguingly delicious desert and for great conversation! 1To prepare the Kiwano, cut them in half from top to bottom scoop out the jelly and seeds (keep the rind) and put into a blender or food processor and purée until smooth and soupy. Now strain through a fine mesh. 2 Now add the lime zest, agave nectar and sea salt and stir until incorporated. 3 Place mixture in refrigerator for one hour to chill. Also place Kiwano rinds in the freezer. After an hour taste sorbet mixture and adjust sweetness accordingly with agave nectar. 4Process in an ice cream machine via the manufacturer’s instructions. The sorbet will have a soft texture right out of the ice cream machine. Now remove rinds from freezer and scoop sorbet into rinds. Place back into the freezer for at least an hour. Garnish with a sprig of Holy Basil. Root Knot Nematodes to be banished from the island!!! Southern Root Knot Nematodes are plant parasitic, microscopic roundworms in the soil, which feed on the root systems of plants, increasing disease potential and starving plants of water and nutrients. As the summer temperatures rise so do the populations of Root Knot Nematodes making mid summer growing near impossible. So we are taking advantage of the heat and using the sun to “solarize” the soils. Keeping the soil covered with plastic for 6-8 weeks to trap the radiant heat is a safe and effective treatment for managing some biological and fungal soil diseases like verticillium wilt, as well as “cooking” soil pest organisms like the root knot nematodes. Upon removal of the plastic we will inoculate the beds with our compost to replenish the population of beneficial bacteria and fungi. Then we will plant a late season crop of tomatoes, cucumbers, squash, and beans. How do you recognize these microscopic pests? Inspect trouble plants when you pull them up for these bumps on their roots. If you find evidence of nematode damage do not compost that plant material and be careful not to “spread” the problem by sanitizing tools between plot/bed maintenance. There are newly available organic, non-gmo, seeds becoming available for summer crops with resistance to RKN. This summer we planted Carolina Wonder Bell Peppers, Tropic VFN Tomatoes (both from Southern Exposure Seed Exchange), and a sweet potato slip called Nemagold. So far all looks (and tastes) good! Chef Paula and Garden Volunteer Shelley harvest Coriander Seeds produced from Cilantro plants “gone to seed” to use in summer pickling recipes. A colander works great to separate the seeds from the stems. Place cucumber, eggplant, zucchini, and pepper slices in a colander set in the sink. Sprinkle with salt; stir to combine. Let stand for 20 minutes. Rinse, drain and transfer to a large heatproof bowl. Meanwhile, combine cider vinegar, white vinegar, brown sugar, onion, garlic, dill and mustard seed in a medium saucepan. Bring to a boil. Reduce heat and simmer for 10 minutes. Pour the hot liquid over the cucumber and vegetable mixture; add herbs stir to combine. Refrigerate for at least 10 minutes to bring to room temperature. Prepare canning jars according to box directions. Ration pickle mixture among jars and seal. Refrigerate until ready to use. Make Ahead Tip: Cover and refrigerate for up to 10 days. You can also use any fresh herbs you like to add more flavor to your pickles.